Delicate and fragile, like tiny pieces of spun lace, a snowflake is whimsical and reminiscent of Christmas. Strung from a Christmas tree, or placed on your holiday cake, these edible snowflakes will bring a touch of the spirit to your home. 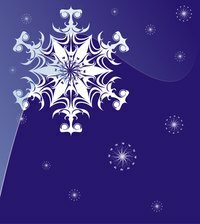 Decorate them with powdered sugar or food coloring to add variety or leave them plain, as you choose several different patterns for your snowflake. And make a large batch as these treats are sure to be eaten. Mix the powdered sugar, the meringue powder and warm water in a large bowl. Plug in the egg beater and beat the mixture on high until you see peaks form, usually about five minutes. Mix in the extract and the food dye after the peaks have formed. Spoon the icing into a plastic bag. Gather the contents toward one corner and snip the end 1/4 inch for use as a spout. Cut a section of the wax paper for your pan. Place it in the pan. Draw snowflakes onto the wax paper or use a printed pattern under the wax paper. Squeeze the bag as you follow the lines of the snowflake. Draw the long lines first, and then fill in the smaller shapes. Use a cooking brush dipped in water to keep mixture moist while shaping the snowflake. Dust with edible sprinkles, powdered sugar or glitter while wet. Allow the snowflake to dry. Use dental floss or nylon string threaded through a section of the snowflake to hang them. Make several batches of different colors and designs. Share this activity with children. The thinner your snowflake, the more fragile it is. Eat them within a one week period and store in an airtight container if you are not hanging them.